Q. A male diagnosed with AGA (Androgenetic alopecia) came to me with grade 3 alopecia. Asking me that he is frustrated from taking medication and heard of hair transplant surgery. What advice would you give him? A.I have seen lot of misconception regarding this concept. Hair transplant doesn't mean actual hair. We take follicle from occiput. Why? Because it is not responsive to androgen as there is no Androgen receptor. Hair transplant is for already bald area. Androgen receptor blockade is given for remaining vellus hair. So that means hair transplantation surgery is not substitute for minoxidil/finasteride. For grade 3 AGA alopecia patient can undergo hair transplantation for bald area but have to take medication for remaining vellus hairs. Q. AGA is genetic alopecia. So why don't it appear at birth itself? A. At birth, androgen receptor is present but insensitive. When genetic component become active, the receptor become sensitive and balding occur. Warfarin: a procoagulant or anticoagulant? No doubt ! Warfarin is an oral anticoagulant. Warfarin inhibits reduction of Vitamin K to its active form and leads to depletion of the vitamin K-dependent clotting factors II,VII,IX and X, and protein C,S and Z. Because of the rapid depletion of the anti-coagulant Protein C and a slower depletion of factor II, patients might develop increased hypercoagulability during the first few days of warfarin therapy. So warfarin is combined with a parenteral initially. 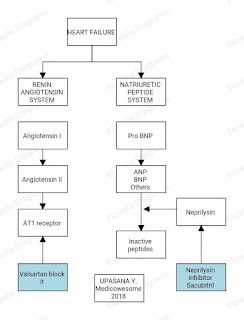 Treatment of DVT/PE with warfarin requires overlap therapy/bridging therapy with a parenteral anticoagulant (UFH,LMWH, or pentasaccharide) for atleast 4-5 days and until the INR reaches atleast 2.0. The starting dose of warfarin depends on many factors. During warfarin therapy INR monitoring should occur frequently during the first month of warfarin therapy (e.g.twice weekly for 1-2 weeks, then weekly for 2 weeks, then less frequently). ARNI stands for Angiotensin receptor-neprilysin inhibitor. This is combination of ARB Valsartan and neprilysin inhibitor Sacubitril recently approved for use in patients with HFrEF and NYHA Class II-IV symptoms. 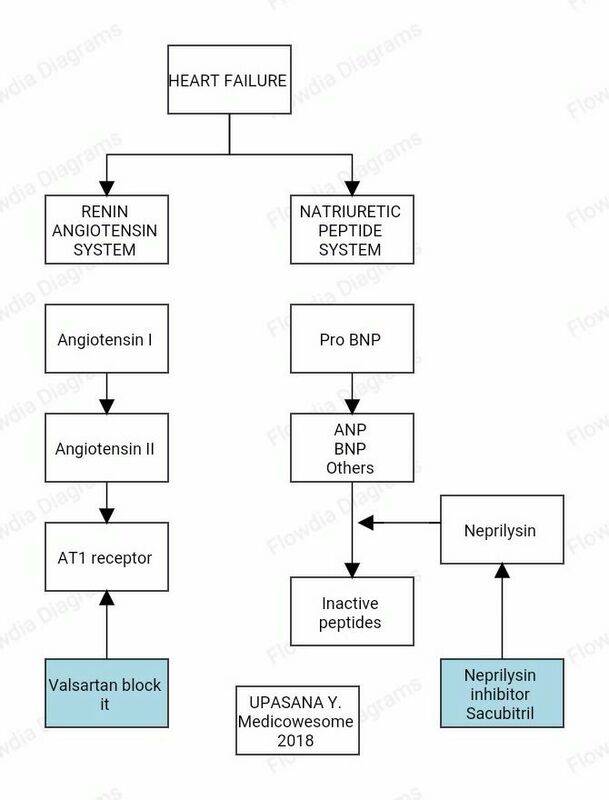 NEPRILYSIN:- It is a neutral endopeptidase involved in the degradation of vasoactive peptides including natriuretic peptides, bradykinin, adrenomedullin. Inhibition of neprilysin increased the availability of these peptides, which exert favorable effects in HF. In a large trial, this agent was shown to be superior to enalapril in reducing death and rehospitalization among NYHA class II-IV patients with HFrEF. The vestibulo-ocular reflex is a reflex, where activation of the vestibular system causes eye movement. This reflex functions to stabilize images on the retinas during head movement by producing eye movements in the direction opposite to head movement, thus preserving the image on the center of the visual field. For example, when the head moves to the right, the eyes move to the left, and vice versa. Since slight head movement is present all the time, VOR is necessary for stabilizing vision. 1)It starts in the vestibular system, where semicircular canals get activated by head rotation and send their impulses via the vestibular nerve and end in the vestibular nuclei in the brainstem.In addition the hair cells of opposite ear are inhibited because endolymph in that ear flows away from hair cells. 2)From these nuclei, fibers cross to the contralateral cranial nerve VI nucleus. 3a)There they synapse with 2 additional pathways. One pathway projects directly to the lateral rectus of the eye via the abducens nerve. b) Another nerve tract projects from the abducens nucleus by the medial longitudinal fasciculus to the contralateral oculomotor nucleus, which contains motorneurons specifically activating the medial rectus muscle of the eye through the oculomotor nerve. 4)For instance, if the head is turned clockwise, then excitatory impulses are sent from the semicircular canal on the right side via the vestibular nerve to the right vestibular nuclei in the brainstem. From this nuclei excitatory fibres cross to the left abducens nucleus.There they project and stimulate the lateral rectus of the left eye via the abducens nerve. In addition, by the right medial longitudinal fasciculus, fibers cross and go to right oculomotor nuclei, they activate the medial rectus muscles on the right eye. As a result, both eyes will turn counter-clockwise. Hello, let's dissect fat necrosis in this post. Fat necrosis is seen where fat concentration is more or lipase concentration is more. Example- Injury to Breast or Omentum tissue or in Acute pancreatitis with gall stones or alcohol intake. Alcohol intake leads to activation of lipase enzyme. This lipase enzyme converts lipids to fatty acids. Always remember fatty acids loves calcium! This love affair leads to formation of "Fatty acids - Calcium complex formation". This is called as "Saponification". This gives yellow - white chalk like color. This helps surgeon to identify fat necrosis. For prognosis we use serum calcium level. Why? Suppose there is severe pancreatitis. This leads to more activation of the lipase enzyme. This leads to formation of the fatty acids. More fatty acids, more saponification. Hence less calcium level in serum! Low calcium level suggest bad prognosis! Hello! This is Ultra short post regarding Chediak higashi syndrome! Hope you like it. In normal person, when bacteria is engulfed by WBCs, they are carried to lysosome enzyme by LYST protein. LYST protein stand for Lysosomal transfer protein. Defect in LYST protein causes Chediak Higashi syndrome. It is autosomal recessive disorder. No LYST protein so no phagocytosis of macrophages. Hence recurrent infections. 2) Absence of Melanin - Albinism. 3) Decrease in Myelin formation - Delayed conduction. LYST helps in maturation of megakaryocytes to platelets. Confirmation: Incomplete digestion of bacteria leads to formation of "Giant granules inside cell"
Horner syndrome is a classic neurologic syndrome whose signs include miosis, ptosis, and anhidrosis. 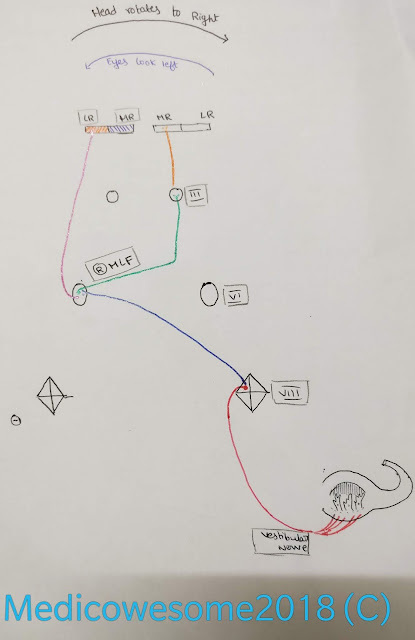 ●The first-order neuron descends caudally from the hypothalamus to the first synapse, which is located in the cervical spinal cord (levels C8-T2, also called ciliospinal center of Budge). ●The second-order neuron travels from the sympathetic trunk over the lung apex. It then ascends to the superior cervical ganglion, located near the bifurcation of the common carotid artery. ●The third-order neuron from superior cervical ganglia then ascends within the adventitia of the internal carotid artery, through the cavernous sinus. In the orbit and the eye, the oculosympathetic fibers innervate the iris dilator muscle as well as Müller's muscle, a small smooth muscle in the eyelids responsible for a minor portion of the upper lid elevation and lower lid retraction. First-order syndrome - Lesions of the sympathetic tracts in the brainstem or cervicothoracic spinal cord can produce a first-order Horner syndrome. (a)occlusion of PICA, which produces Horner syndrome as part of the Wallenberg syndrome. (b)Brown-Séquard syndrome above T1, patient may present with ipsilateral Horner syndrome due to damage of oculosympathetic pathway. Second-order syndrome — Second-order or preganglionic Horner syndromes can occur with trauma or surgery involving the spinal cord, thoracic outlet, or lung apex.Other causes include pancoast tumor involving the lung apex. CLINICAL FEATURES -The classic signs of a Horner syndrome are ptosis, miosis, and anhidrosis. 1)The ptosis occurs as a result of paralysis of the Müller's muscle. 2)The degree of anisocoria is more marked in the dark than in light. 3)Anhidrosis is present in central or preganglionic (first- or second-order) lesions because the sympathetic fibers responsible for facial sweating branch off at the superior cervical ganglion along the external carotid artery and its branches. 4)Horner syndrome is also a common feature of cluster headache. ●Hallux valgus (HV) deformity (ie, bunion) is a common, potentially debilitating deformity consisting of lateral deviation of the hallux on the first metatarsal . The etiology is unknown. The deformity is more common among women and shod populations. ●Although HV is easily recognized by clinical examination, radiographs may be necessary to determine the presence of articular damage . Neither radiographic nor clinical appearance provides the basis for surgical referral, which is determined by patient pain and disability. ●There is little evidence that conservative treatments are useful in the treatment of HV. Nevertheless, we suggest patients without debilitating symptoms avail themselves of conservative therapies before being referred for surgery. ●We suggest that patients with severe pain or dysfunction and those whose symptoms do not improve under a conservative treatment regimen be referred for surgical repair. Approximately 150 surgical procedures for the correction of HV deformity have been described. Few prospective, randomized trials evaluating these procedures have been performed. Patients should be referred to a foot surgery specialist with experience repairing HV deformity. ●Managing patient expectations about surgery is important. Patients should understand that 10 to 25 degrees of valgus angulation is normal at the MTP joint, and that resolution of postoperative pain and swelling may require several months. Most patients will remain unable to fit into narrower shoes. Do not forget to look up pictures of how a bunion looks. Atropine poisoning is also called as Anti-muscarinic poisoning. Let's go from head to toe! Also called as Mad as hatters! Remember: Atropine drives you crazy! Fun fact 1: In ancient times, women used to apply Atropa belladona in eye for attracting men by dilating pupil. Fun fact 2: Most of the dinner dates are candle night dinner, why? To dilate pupils and look attractive. Also described as "Blind as a bat"
Remember: Atropine makes you look seductive! AcH is responsible for secretion of saliva and tears. Lack of AcH action causes - Dry mouth and Dry eyes. Also described as "Dry as a bone"
Most common feature in Adults. AcH causes constriction of blood vessels. Atropine blocks this action and hence causes dilation of the blood vessel. Hence this causes flushing of face. Also described as - Red as a beet. Remember: Atropine makes you blush! AcH is responsible for secretion of the glands. Lack of secretion causes decrease or no cooling effect. Hence it causes-Hyperthermia. Most common feature in children. Remember: Atropine makes you hot! Most common cause of death is Respiratory paralysis. Gastric lavage using Tannic acid : To remove unabsorbed poison. Avoid potassium permagnate. Patient is kept in dark quiet room-To avoid hallucination. Ice bags given to treat maintain temperature. 2) Antidote: Physostigmine since it crosses BBB. 1)Wiskott-Aldrich syndrome is an X-linked recessive disorder caused by mutations in the gene that encodes the Wiskott-Aldrich syndrome protein (WASp). 2)All hematopoietic cells produce WASp protein, and there is WIPF1 that encodes WASp-interacting protein (WIP), a protein that stabilizes WASp. Both of these proteins are required to reorganize cell's cytoskeleton. (a)Formation of the immunologic synapse, the site of interaction between T cells and antigen-presenting cells leading to immunodeficiency. (b)NK cell function is impaired as a result of defective immune synapse formation on the cell surface which leads to increase risk of malignancy. (c)Regulatory T cells are incapable of controlling autoimmunity, so there is increased risk of Autoimmune disease. (d)Myeloid lineage cells exhibit impaired phagocytosis and chemotaxis - susceptible to recurrent pyogenic infections. (e)Impaired cytoskeleton in megakaryocytes → Decrease in size and number of platelets →microthrombocytopenia. (d)Increase in risk of autoimmune diseases and malignancy. (a)low to normal IgG and IgM and high IgA and IgE. (b)Peripheral smear-Thrombocytopenia with small platelets. (1)WASp mutation (2)wasp is a small bee like insect🐝→small platelets and if wasp bites, you get eczema(↑IgE). Usually left sided cardiac pathology causes bilateral pulmonary edema but still unilateral pattern is seen in fair number of cases, usually involving right lung parenchyma. 1) Lymphatic drainage on right side is via low calibre right bronchomediastinal trunk as opposed to more robust thoracic duct on left side. 2) Numerous conditions ranging from hypertension to valvular pathology can cause enlargement of left side of heart. This will preferentially impinge on left pulmonary artery causing reduced capillary perfusion and ultimately congestion of left lung parenchyma. 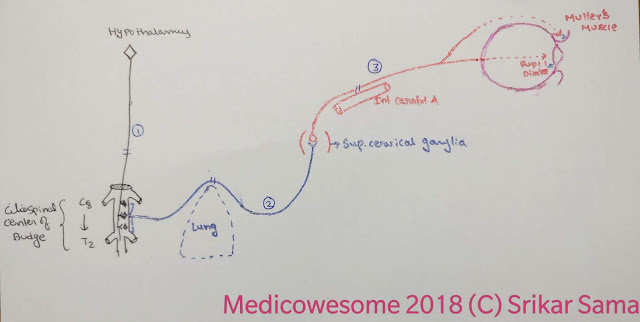 3) In cases of mitral regurgitation jet of regurgitate can preferentially impact either of the right or left pulmonary veins, hence explaining more profound edema on either side. So, if according to patient's history and clinical examination suspicion of cardiac failure remains high, then immediate intervention with diuretics and nitrates is warranted in spite of unilateral pattern of pulmonary edema. Delicate balance between food consumption and energy expenditure involves modulation of orexigenic and anorexigenic signals at hypothalamus. OREXIGENIC PATHWAY- It involves peripheral mediators like ghrelin and neuropeptide-Y. They act on NPY-AgRP(neuropeptide-Y and agouti related peptide) neurons which subsequently mediates orexigenic signals via second order neurons that release peptides like orexin at hypothalamus. ANOREXIGENIC PATHWAY- It involves peripheral mediators like leptin, amylin and PYY(Peptide YY). They act on POMC/CART(Pro-opio melanocortin/Cocaine and amphetamine regulated transcript) neurons. These neurons release alpha melanocyte stimulating hormone which in turn stimulates second order neurons that release TRH ,CRH and hence mediates catabolism. They also simultaneously inhibit anabolic pathway. Now back to pathogenesis of obesity in these syndromes. In Prader-Willi syndrome levels of PYY are low due loss of imprinted genes on chromosome 15q11-q13. This results in reduced catabolism and enhanced unihibited anabolism. It is not uncommon for such patients to have BMI above 40. In WAGR syndrome there is haplo-insufficiency of BDNF(Brain derived neurotrophic factor). Alpha melanocyte stimulating hormone in catabolic pathway acts through melanocortin receptors(MC4R) on second order neurons. Downstream signalling pathways of MC4R involves BDNF hence explaining obesity in these patients. In fact efforts are already underway to reduce PPY levels and modulate BDNF to control obesity in these disorders. 1)PNH originates from an acquired mutation ( frame-shift that creates a premature stop codon) in a myeloid stem cell, the acquired mutation in PNH occurs in the PIGA gene which is responsible for the first step in the synthesis of the GPI anchor that attaches CD55 and CD59 to the cell surface. 3)In the absence of these inhibitors, complement proteins bind cell membranes of our own cells and through the alternative complement pathway can lyse self-cells. 4)CD55/DAF decrease → More C3 convertase→Increase C3b→Increase opsonization→Extra Vascular Hemolysis. 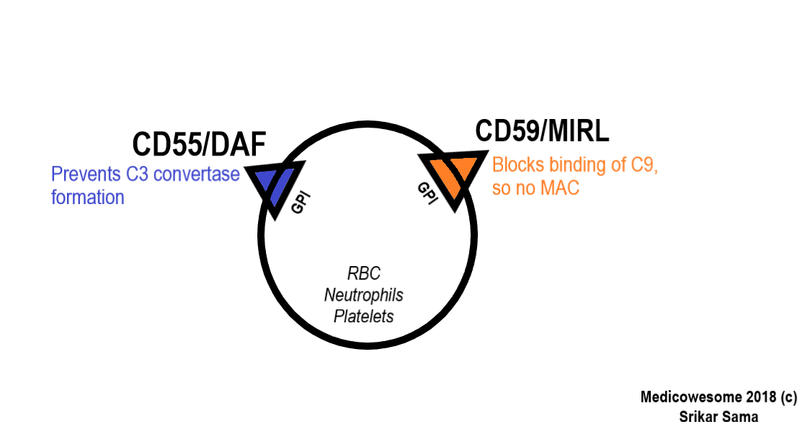 CD59/MIRL decrease→More MAC→Intra Vascular Hemolysis. 5)Why nocturnal hemoglobinuria- hemolysis occurs throughout day but its more at night because: (a)Increased hemolysis in night due to respiratory acidosis(Shallow breathing). (b)Overnight concentration of urine is more and hemoglobinuria is clearly evident. 6)Diagnosis:(a)Flow cytometry- decrease CD55 and CD59 levels. (b)Eculizumab- It is an Antibody to C5 and prevents its clevage to C5a and C5b, so no MAC. Ravulizumab has a half life that is three to four times longer than eculizumab.